[ The Gaiety Theatre, Aldwych, London. ] 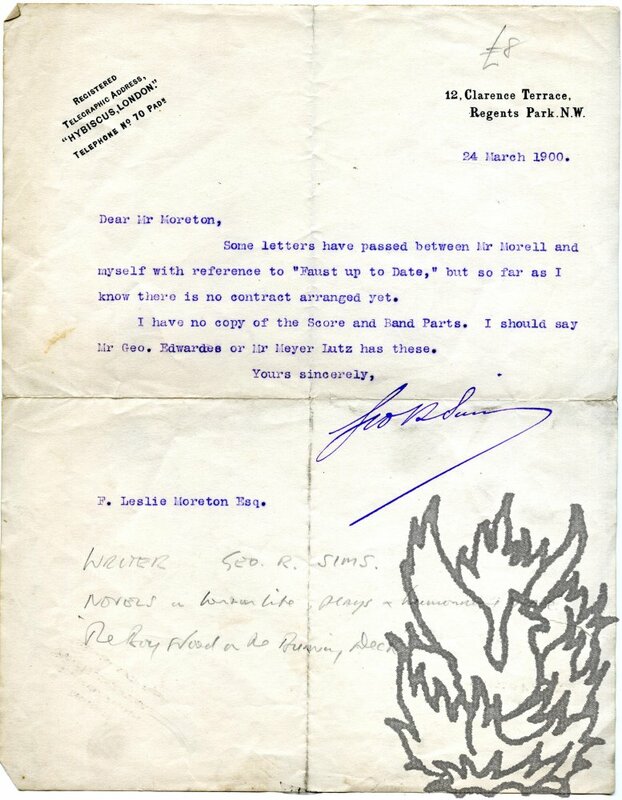 Two Autograph Letters Signed from H. Hugh Harvey to theatre historian W. J. Macqueen-Pope, reminiscing about 'theatrical matters' andn in particular the Gaiety Theatre. Both on his letterhead, 24 Wessex Gardens, Golder Green, NW11 [ London ]. 12 and 16 January 1950. Both in good condition, on aged paper. ONE: 2pp., 4to. He reminds Macqueen-Pope that two years previously he was 'kind enough to receive me at your Office and, after a long and most interesting chat on things theatrical (over an hour, as I recall!) 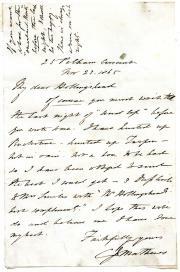 you wrote into my copies of your "Drury Lane" and "Carriages at Eleven" two very greatly appreciated inscriptions, by way of friendship'. He now has his 'delightful "Gaiety" and splendid 'Haymarket", and asks for 'another pow-wow' at 359 Strand. [ Herman Finck, composer and conductor. ] Collection of unpublished Autograph Papers, comprising joke collection 'Green Roomers by the Rags Wags', and plan of book to be titled '"In the Chair." More memories'. With covering letter from Finck's wife. 1920s [one part dated 1921]. 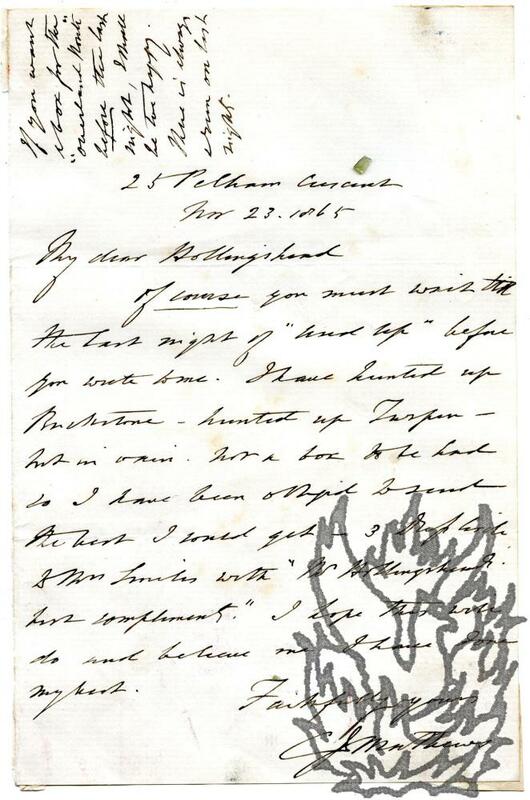 Mabel Fnck's covering letter dated from 10 Grove End Gardens, St John's Wood, NW8 [ London ]. 15 February 1956. In good condition, on loose leaves, with light signs of age and wear. ONE: 'Green Roomers by the Rags Wags.' A large collection of original jokes. Around 140pp., mostly 8vo. On different papers, including letterheads of 212 Finchley Road, London, the Burlington in Folkestone, and the Hermitage Hotel, Le Touquet. Hundreds of unconnected gags, each of them framed as a rhetorical question, mostly relating to the London entertainment world. The humour is now mostly impenetrable. Individuals referred to include: C. B. Cochran, H. G.
[ Herman Finck, composer and conductor. ] Unpublished corrected typescript of 'some things of humour that I remember', titled 'Life's Little laughs', with references to George R. Sims, J. Hickory Wood, Arthur Roberts, Alfred Plumpton. + 19pp., 4to. Unbound, on leaves attached with a brass stud. Title-page reads: 'LIFE'S LITTLE LAUGHS. | BY | HERMAN FINCK.' In good condition, on lightly aged and creased paper. The introduction reads: 'Laugh, and the world laughs with you. Cry, and the world laughs at you. Here then let me set down some things of humour that I remember, some of my own which have appealed to my friends, some of my friends' which have appealed to me. Album of correspondence and newspaper cuttings., including material relating to ecclesiastical matters, Liberal politics and Bedfordshire. See obituary, Times, 31 December 1935. Son of geologist James Wyatt. Educated at Christ Church, Oxford. Books include 'Hardrada, and Other Poems' (1878). Most items in the album laid down on around forty leaves of an 8vo ledger, but much matter loosely inserted. Ledger internally sound and clean, in worn, sturdy boards, with spine lacking. Contents in good condition, clear and complete. Cuttings browning slightly. Typed Note Signed ('Geo R Sims') to F. Leslie Moreton. George R. Sims [George Robert Sims] (1847-1922), English journalist and writer. 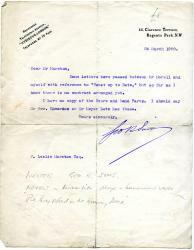 24 March 1900; on letterhead of 12, Clarence Terrace, Regents Park. N.W. [London]. 4to: 1 p. Text complete and clear, on aged, spotted and lightly-creased paper. He has exchanged letters with 'Mr Morell' 'with reference to "Faust up to Date" ', but does not believe any contract has yet been arranged. He does not have a copy of 'the Score and Band Parts': 'I should say Mr Geo. Edwardes or Mr Meyer Lutz has these.' Sims co-wrote 'Faust up to Date' with Henry Pettitt. The music was by Lutz. It was produced by Edwardes, and first performed at the Gaiety Theatre, London, on 30 October 1888. 30 May 1904, Gaiety Theatre. English actor (died 1914). "Dear Sir / My height is five feet three & a half inches in my half hose". Negligible traces of previous mounting to the blank reverse.